It could take much more than the $80 million in new federal aid that President Obama has promised Michigan by this week to remove lead contamination from Flint’s public water system, officials and local experts said. What will ultimately be needed to fix the system isn’t fully known yet. But a chemical treatment regimen is expected to begin the process, and engineers highlighted a number of technical fixes, such as liners and coatings, in interviews with Crain’s. But that funding largely addresses needs like bottled water for nurses, filters and funding to hire more school nurses, with only a fraction earmarked for infrastructure. None of the funding is expected to solve the bigger problem of how to get lead out of the city’s sprawling network of pipes. Kurt Weiss, a spokesman for the state Department of Technology, Management and Budget, said “no long-term infrastructure costs have been identified,” as of last week. “We do know the replacement of the entire system would be very costly and take time,” Weiss said. Officials from the Michigan Department of Environmental Quality were not made available to Crain’s to discuss the lead problem, the city’s water infrastructure or the anti-corrosion methods being used. A preliminary estimate in a September daily briefing to Snyder released along with some of his emails last week pegged the cost to replace lead service lines in the city at $60 million or more, but some Flint city leaders, including Mayor Karen Weaver, have estimated the bill could be as high as $1.5 billion. Gov. Rick Snyder said he will create a commission to study the state of Michigan’s underground infrastructure and the cost of updating it. That’s probably excessive. Local experts told Crain’s the lead problem doesn’t seem to affect the entire city equally — but the briefing estimate seems to address only the cost of replacing service lines that directly connect to homes and businesses in the city, not the mains or connectors that run for miles and might also hold lead elsewhere within the water system. State leaders budgeted $500,000 just to study the city’s water infrastructure. Another $2 million is proposed for “additional water system needs including new system infrastructure,” which Weiss said could pay for hook-up costs and final piping work to get the city connected with the Karegnondi Water Authority system under construction. City leaders and the state DEQ have been discussing how to spend the funds, he said. But neither the interim reconnection to metro Detroit’s own Great Lakes Water Authority about two months ago, nor the Karegnondi connection later this year, can reverse the corrosion that’s already happened in water lines (and which caused lead from the lines to leach into the water in some homes) since the city separated itself from the Detroit system and began drawing water from the Flint River in April 2014, experts said. At best, the new sources can bring water with less corrosive agents, and keep things from getting worse. Removing lead from the water will involve either dosing the water supply regularly with phosphates, as Flint began to do last month, or installing new liners inside corroded pipes to separate the flow from the corrosion itself. Snyder has said publicly he is expecting phosphate coatings to help address the immediate problem, and a portion of the budget supplement going to the Senate further funds anti-corrosion measures. But the bill is intended only to address immediate concerns in Flint, said Snyder spokesman Dave Murray. “Six inches and up (pipe width) is the common application range for installing pipe liners. There’s some 4-inch technology that’s come to the fore, but when you’re talking that size, there’s still a cost issue and (water flow) capacity issue,” said Fred Tingberg Jr., business development manager of Lanzo Lining Services, one of the Roseville-based Lanzo Cos. The Sept. 28 briefing memo to Snyder estimates that Flint has about 32,900 service connections to its public water systems, of which 15,000 might be “considered lead service lines.” At $4,000 per home, they would cost $60 million to replace, although some home replacement costs can run as high as $8,000. President Robert McMahan of Kettering University in Flint said in a letter to university parents and alumni last week that the university has tested water from six input lines to the campus 15 times in the last several months, and 12 of the tests detected no lead. In the three samples were lead was found, levels ranged from 1 part to 7 parts per billion — the U.S. Environmental Protection Agency usually allows up to 15 parts per billion before seeking corrective action on lead. “These were single point in time detections; later repeat testing of the same distribution points detected no lead,” McMahan states in the letter. “(And) no lead has ever been detected in any water source used for food preparation” at Kettering. At issue in Flint is lead within water pipes and particularly lead packing or “solder and flux” in the joints or seams connecting pipe lines, which cities used in pipe installation since at least the early 20th century. A 1986 amendment by Congress to the federal Safe Drinking Water Act prohibits all but “lead free” pipes, solder and flux in public water systems or private plumbing lines that supply water for human consumption. The rule requires public water systems to have 0.2 percent lead solder and flux or less, and contractors who spot lead joints or solder during pipe maintenance are also supposed to report and replace them. But this rule is unevenly enforced and doesn’t address repairs where no digging occurs and no packing is seen. However, lead solder is usually external and coatings in the pipe interior and some naturally occurring mineral deposits within the lines keep the water out of contact with it — so long as the water itself isn’t too corrosive. Aggressive anti-corrosion treatments at the Detroit Water and Sewerage Department usually kept Flint and other communities with old infrastructure out of danger, until Flint separated from DWSD and began drawing water from the Flint River in 2014. Local experts said the Flint River had more corrosive agents and wasn’t being treated as aggressively at first, until corrosion inside the pipes brought lead into the flow of water. Once that happened, virtually any pipes downstream from a leaching contamination point would be affected even if the other pipes contained no lead. Local contractors like Lanzo, Inland Waters Pollution Control Inc. and Blaze Contracting Inc., all have held lining contracts with DWSD in the past, often in collaboration with St. Louis-based Insituform Technologies LLC. But the traditional “bag liners” that generally get installed inside a pipe cannot effectively seal up joints, or splits and intersections of pipes — and the tools that unfurl them have difficulty passing through pipes less than 6 inches in diameter. A more recent polymer spray-on liner can handle splits and joints or bends in water lines, and Baglier said his company has installed liners in 5-inch lines before. But the cost can vary drastically depending on how many connections a length of pipe has, where in the city is being installed or even the place where it’s used. Baglier’s company finished installing liners at a site in Saginaw and another in Cleveland last year, but Baglier said his service is still more widely used in Canada than the U.S.
$36,500 for a year’s worth of anti-corrosion control, which includes adding phosphates to the water system to prevent lead from leaching from pipes. $2 million for replacement of plumbing fixtures, such as faucets and drinking fountains, in city schools, day care centers, adult foster care centers and nursing homes, hospitals and surgical centers — although that applies only to above-ground fixtures. 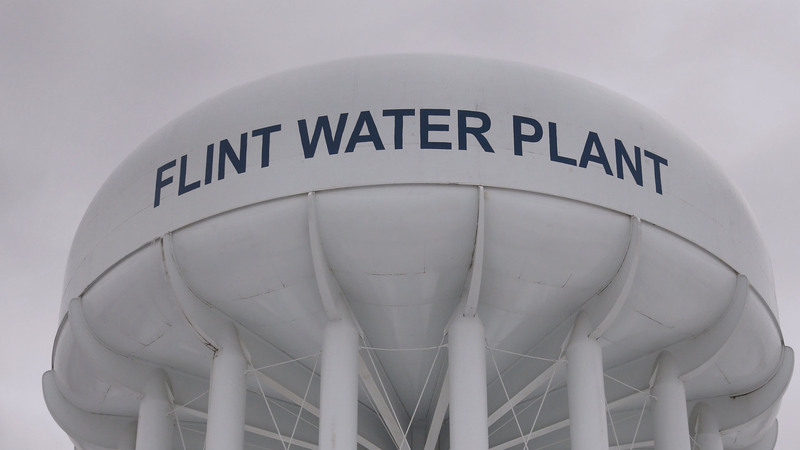 Flint is certainly not the only Michigan city to rely on lead pipes to carry drinking water. But the city’s crisis laid bare the challenges of replacing underground infrastructure that is aging or failing, both in terms of cost and complexity. During his State of the State address last week, Snyder said he will create a commission to study Michigan’s infrastructure — water and sewer lines, roads and bridges and broadband Internet, among them. The commission will be expected to report recommended updates — and ways to pay for them — by September. Snyder called the state’s old underground pipes “a hidden problem” that stays out of sight until the next power failure, flood or water issue. “We need to invest more in smarter infrastructure so we avoid crises like this in the future,” Snyder said. "Oh, big government (read: taxpayers, foreign loan sharks), please save us." Sure some immediate cleanup is needed. Replace all the lead pipes?? ...they were just fine until the water authority messed up and failed to properly treat the water. First thing to do is terminate the miscreants. Oh, wait, they're in a government employee union. rats. What about the fact that most adults throughout the country have higher blood lead levels than Flint's kids, and (mostly) are just fine. They got it before the EPA went b-s crazy on acceptable levels of stuff. BigD, " What about the fact that most adults throughout the country have higher blood lead levels than Flint’s kids, and (mostly) are just fine. " Read your diatribe. Are you sure? And the Flint water supply system is just one particle when compared to the infrastructure needs of the whole country. Everyone cares about it, but no one wants to pay for it. Maybe if we didn't give away so much to rebuild foreign nations, we'd have a little more to give to our own infrastructure. The well of money is not infinite. Yet another press article that stays clear of the gross negligence of the operation of the Flint water treatment and state and federal oversight. Hidden is the truth is the fact that for a yearly cost of less than 40,000 the Flint River water could have been made non-corrorsive. A pH test strip is as expensive as 1 penny. These are used by anyone with a pool and the results are acted on with common knowledge. The long term solution to "fixing" Flint and making sure a similar situation doesn't arise in another city is to remove the State's financial backstop for local governmental units (including school districts) and allow them to go into bankruptcy when they need it. This eliminates the dreaded financial manager being forced on locals because the state is no longer responsible for backstopping any local debts. I trust the financial and creditors to instill fiscal discipline to locals far more than any financial manager let alone letting an "emergency manager" making the technical water decisions for the locals who actually live with and pay for it. Let's be very clear on this. The problems in Flint are the problems of older cities everywhere. For 70 years we have pursued a public policy that put significant state and federal funds into expanding infrastructure into suburban growth at the expense of maintaining/improving what we already had. That public subsidy of expansion contributed to the hollowing out of our legacy cities, and their subsequent economic collapse. These subsidies were supported by republicans and democrats alike; no party is without responsibility. Now, the question is how we are going to solve the problem writ large. Not only in Michigan, but across the country. Susan, your comments are spot on. Those of us who have worked our entire careers in urban revitalization and sustainability have been sounding the aging infrastructure alarm for years. Hopefully, much good will come out of the Flint debacle by bringing this critical issue to the attention of policy makers and politicians nationwide and getting the our public resources re-prioritized. Susan is absolutely right about subsidizing suburban infrastructure being unwise. The people who bought homes in the suburbs should have paid the full cost of their decision. Not doing so resulted in more homes being built in the suburbs than would have otherwise been the case. The resulting reduction in demand for houses in urban areas devastated real estate values in those areas. Susan is right - and the tax cost continues. A mile of water line in the suburbs serves only 1/3 to 1/2 as ,many homes as in a city. And the cost of plowing or maintaining a road in front of homes with 200 feet of frontage is about 4 times as costly as an urban street with 50 foot lots. Because those water lines and streets are (generally) newer - we don't see the costs as a problem - but in the decades to come, that cost will be HUGE. I believe the $80million is for the entire State, not just Flint. So here's our infrastructure problem in a nutshell, using water systems as an example. Let's say a city deems a water system necessary. They need money to build it, so usually that's a bond or loan of some type (hopefully it's not a state or federal grant because that would mean we're all paying for their decision). Next they need money to operate and maintain the system. The O&M and debt service are combined and rates are calculated to charge the users to pay for the system. BUT, what happens when the system needs to be replaced? Where's the money for that? Basically we pay to build things and run things, but we don't pay to replace them...that cost is kicked down the road to future generations...hence, the more we build the deeper is the hole we dig for ourselves and our kids. We need to require replacement cost to be part of the initial calculations and payments...but it seems nobody does that. Barry, you are absolutely correct, and money should be set aside through the years for maintenance and replacement when the time comes. The practical problem, however, is political. Have you watched your local city council meeting when water rates are set? Many residents will complain about the rate, complain about Detroit, say they cannot afford the proposed rate, and etc. The elected officials, wanting to please their constituents, reduce the rate thinking that some future council can deal with the problem of deferred maintenance. The end result is that repair costs go up, because they have to be made on an emergency basis when a water main breaks, and the cost of replacing aging pipes causes a sudden jolt in water rates because no money, or not enough money, has been set aside for repair and replacement. This may not be the result in every community, but it is not uncommon. Mr. Visel is absolutely right when he maintains that people should pay the costs of their decisions, but he violates that rule when he says that current users of infrastructure should pay for its replacement. The future users of the new infrastructure should pay for its construction and maintenance. That is consistent with individuals paying for what they use. Years of neglect by government. Taking care of important things first...gerrymandering, no straight ticket vote, money in all bills voters might not like, trying to kill unions, sale of fire crackers, no helmets, open carry and concealed guns, and the beat goes on.If the leg I s l a ture weren't all looking for their next job, they might take care of serious things. Don't forget taking over local governments with emergency managers. Why didn't the state help this people in a cooperative way? What is it going to cost? Whatever it costs. That's the difference between the business paradigm and the governing paradigm. Service the public not the balance sheet. Yes, there should be standards and guidelines but governance is about all the people. When government puts money away for that inevitable raining day, social security for example, politicians see that as an opportunity to avoid facing reality, deferring hard decisions to the future. Public financing of campaigns is one part of a solution to inhibit the political tendency to make really stupid short term decisions. Mr. Fellows is being wildly optimistic in his assessment of the time horizons and integrity of voters. He blames politicians for not properly funding programs like Social Security, contending that they view it as an "opportunity to avoid facing reality, deferring hard decisions to the future." Has it occurred to him to wonder why politicians consider it a "hard decision"? It is because there is no support among their constituents for proper, timely funding. Is he aware of how many Michigan communities have promised their employees far more generous retirement benefits than they have been willing to pay for? Why don't voters elect politicians who are willing to properly fund those retirement programs on a timely basis? There are better questions than that. 1. Why do we allow government bodies to use outrageous multipliers? If the legislature wants to help, it can set the public pension multiplier at a maximum of 2.0--if government-offered defined benefit plans are allowed at all. 2. Why are overtime and leave time allowed to artificially inflate he final average compensation? A firefighter making a base salary of $60,000 retires with 30 years of service. A reasonable multiplier of 2.0 would give him a pension of $36,000. Instead, he is allowed to load up on overtime, then cash in all his accumulated leave time and add it to the FAC so his pension base is $80,000 instead of $60,000. Taxpayers and current governments are stuck with the outrageous multipliers--2.5 to 3, sometimes larger when increased by retirement incentives--passed out by prior officials who don't have to make good on them. So now instead of getting 60% of $60,000, the firefighter gets 90% of $80,000. He gets a pension 20% larger than his working salary. What politicians can we elect who can fund that? ArtZ, your points are spot on. State Government made these changes in 1997. 70% of state employees are now in a 401K. The old system had a multiplier of 1.5 and an occasional incentive of 1.75, (last around early 2000's). Municipal and County governments refuse to address this issue. Many say "it is fully funded so it doesn't matter" when in fact that's the first bill they pay and have less for other services. Governments have few qualified individuals as either elected officials or civil servants and life is made miserable for them. The train wreck results from the corrupt party bosses in both parties who want stooges/puppets for candidates. When I sought the nomination for UM Regent candidate in 2012 this was made perfectly clear to me. We do NOT want independent thinkers. The party bosses run the governments to advance their own financial agendas. The governments must be restarted...a little like Vietnam where "We had to destroy the village in order to save it". The end is near, and as noted by Murphy "Things can get worse". Amerika and Michigan will be just like Somalia! To read in this article that Snyder is going to appoint a commission to study Michigan's infrastructure needs and how to pay for them is laughable. What about the years of wasted talk regarding our roads? Lansing does not have the ethical fortitude to stop the senseless austerity and start addressing real issues that need funding. Politicians think when they say something they are doing something. We have met the enemy and it is us. Just keep pouring BILLIONS into other countries and pork barrel projects. This problem although very,very serious is only the tip of the iceberg. Fix our roads,bridges and dams to start with. No lets give the money to businesses and the results will trickle down to the little people. Snyder please consider resigning and go back to Nerding. Mr. non transparent is anything but that. Peace R.L. Great!! I can just see the new highway repair tax being diverted to this, instead of the roads and bridges. Anyone in this state who drinks tap water, including well water, is out of their minds. Because we used the state land and waterways for toxic waste dumps for over 100 years; NONE of the water is safe to drink. On top of that, municipal water is treated with Chlorine and Fluorine. Both of these are toxic chemicals. Drink steam distilled water, even if you have to do it yourself. It is time to stop wasting tax payer money on foreign aid and constant bush wars and concentrate that money on repairing this country's infrastructure. Easy fix. Hire only foremans. Then congress can pass a mandatory participation to receive unemployment benifits. You show up and work for a the city or township with issues. What happened to all the tax money that should have been invested in the infrastructure--went to employee benefits that we can no longer afford. Also, corrosion control is only a bandaid. Please address how the kids in Detroit who are missing school are getting Free or reduced lunch? They count on this meal. The article is factual and it probably makes sense to begin the long overdue job of getting a number on the overall fix. My concern with the article is that it does not deal with the accountability. To say that the 80 million from the Federal government goes to the state and not just to Flint is to be expected and tragic. After watching this current state government in action, my imagination goes to these senators and reps, sitting around trying to figure out how to get their hands on that money. I would highly recommend people listen to the NPR special report on Flint. It is excellent. I have lived in Michigan all of my life and I have never seen such a self serving state government that we have today, in that time. Neither party thinks about the impact of their decisions on the people, they just think about the next election. How many more crises will it take for them to open their eyes? Where is the professional discussion of permanent brain damage to the developing brains of babies and young children? All this talk of what is going to be done to fix the problem fails to address the irreversible damage to developing brains. All the kings horses and all the king's men can't make those children better again. Apparently everyone is afraid to tell their parents that fact. Pediatric neurologists and all those who have studied the long-term effects of lead poisoning in children should be speaking up to clarify this issue. Pretending that the governor can fix this problem only means it will never be dealt with in a way that bring the greatest amount of help and support to the children and their families who will be dealing with this damage for all of their lives. Once again I am left with the strong sense that a cover-up is the main goal of government and lives of the children and their families be damned. Please give an honest report on this sad situation. It may not be covered in the media, but it isn't something that is being kept from the people of Flint. Most of the social justice circles I'm in have been talking about this, especially in the context of the school to prison pipeline and the for-profit prison movement. And I know I have heard it from some of the organizers in Flint, including the doctors who were first noticing the problem in their child patients. While the government may not give a damn (and may look forward to the kickbacks from the privatized prison services), this is very much a topic of concern. We need a separate article focusing on what support will be needed and what we can expect some of these children to struggle with.